Designated drivers will be celebrated at 13 country racing meets across Victoria this season, under a new Transport Accident Commission (TAC) online initiative starting today. For the next month, people can head to Country Racing Victoria's Facebook page to sign up for the chance to win a Zero Hero trip to the Hanging Rock Cup and a VIP marquee on Australia Day with nine friends. All entrants have to do is fill in their details and come up with a creative race name to honor their heroic designated driver. The winning entry will be used to rename a race at the Hanging Rock Cup on 26 January, 2015. The TAC has ramped up its support at country race days across the state and CEO Janet Dore said she hoped it would result in less drink driving offences. "Drink driving remains one of the biggest killers on Victorian roads, with around one in four drivers or riders killed having a blood alcohol limit above 0.05," Ms Dore said. "This is unacceptable and we will continue to trial new initiatives to reduce this tragic figure," Ms Dore said. The Zero Hero concept was created following TAC research which showed that regional drivers were more likely to drink and drive than residents in metropolitan Melbourne. Regional drivers said they ran the risk of drink driving if they felt there was no other way to get home, their trip home hadn't been planned or that they were a good driver and in control – regardless of having consumed alcohol. "The TAC's advice is to plan your day at the races well in advance and, if you are planning to drink, plan not to drive," Ms Dore said. "We know that after a busy country race day there is public transport on offer, but for the many who may be travelling by car in other directions, we're encouraging and rewarding designated drivers who choose to do the right thing and help get their mates home safely." In addition to this exciting competition, race-goers who commit to being the 'Zero Hero' for the day at select race meets this season will automatically win a coffee cup, sunscreen, air fresheners and confectionary. The TAC breath testing team will also be on course to help race-goers avoid drink driving. 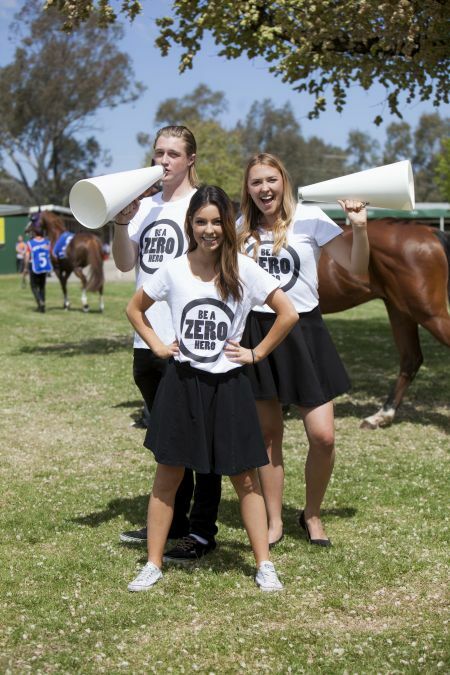 Punters should look out for Zero Hero staff at major race meets in Geelong, Bendigo, Kyneton, Dunkeld, Ballarat, Mansfield, Drouin, Dederang, Healesville, Yea, Balnarring, Woolamai and Warrnambool in the coming weeks and months. This special focus is part of the TAC's on-course presence, which aims to encourage and reward race-goers who put their hand up to not drink and drive. The Zero Hero Facebook competition closes on 14 November. To enter, visit www.facebook.com/CountryRacingVictoria.